Chicken soup with matzah balls. Now that it is really starting to feel like winter, I thought it was time to get you to lug out that big stock pot and get some new soups simmering on your stove. Soup has always been the perfect food of immigrant people, as its main ingredient is water. Add a few vegetables, some grains or legumes, and you have a nourishing meal. Soups have served our people well in rich times as well as poor. Chicken and meat soups were often saved for Shabbat or other special occasions, yet elegant consommés and vegetable combinations --- like the vibrant, regal beet borscht --- are both healthy and festive. Unless one is a vegetarian, no Jewish cooking repertoire is complete without a good recipe for chicken soup! There are as many versions as there are cooks, and seasonings vary with the country of origin or adopted region. Greek Jews enjoy their Avgolemono, made with rice and fresh lemon juice. In New Orleans you might enjoy a "Creolized" concoction fragrant with curry and cayenne pepper. I have seen Sephardic and Southwestern versions with fresh cilantro and chiles. Joan Nathan has a recipe for Yemenite Chicken Soup in Jewish Cooking in America made with a spice mix that includes garlic, fenugreek, saffron and cardamom seeds. My chicken soup is about as simple and basic as can be. It is the real deal Jewish Penicillin, a traditional Ashkenazic recipe I enjoyed on a weekly basis in my Grandma Rosie's kitchen, served with slices of carrots and a huge helping of fine egg luchshen. My Aunt Janet adds a whole, peeled sweet potato to her chicken soup, which slightly sweetens the broth and fills her kitchen with a wonderful aroma. Though my mother made the lightest, fluffiest matzoh balls, try as I might, I have just never matched hers. These days, when I do not use Streit's matzoh ball mix (a "secret family recipe" shared with me by a friend whose matzoh balls always garner compliments! ), I like to experiment with different matzoh ball recipes. Don't just serve them with chicken soup, though! 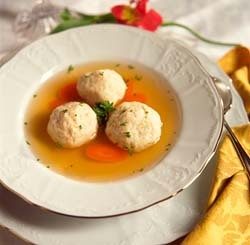 Matzoh balls are also terrific with chunky vegetable soups and as an accompaniment to creamy soups such as carrot and butternut squash. I hope you enjoy this collection of soups to warm your tummy and your soul. If you add the optional sweet potato, leaving it whole is a must, as it makes for a clearer broth, since sweet potatoes disintegrate if cut up. Crushing the peppercorns instead of grinding them also contributes to a fine, clear soup. Do not be tempted to cook your noodles in the soup, as doing so will drink up your broth and the starch in the noodles will make the broth murky. Remove the fat from the cavities of the chicken and rinse well under cold running water. Run your fingers over the insides and scrape out any remaining innards. The cleaner your chicken, inside and out, the clearer your broth will be. Remove the chicken to a large platter and when it is cool enough to handle, remove the meat from the bones. Reserve the meat to serve alongside the soup or to make a chicken salad or sandwiches. Return the bones and skin to the simmering soup and cook for another hour or so. Before serving, reheat the soup and taste to correct for seasoning. It is likely you will need salt and perhaps more pepper. Makes 5 to 6 quarts. Just before you are ready to serve your soup, fill a large saucepan half full with fresh cold water and bring it to a boil with a 1/2 teaspoon salt. Cook 8 ounces fine egg noodles until thoroughly cooked, just past the al dente stage --- soft but not mushy. Drain well. To serve, in each soup bowl, spoon in a generous helping of luchshen, shredded or sliced chicken, soup and vegetables. Garnish with snipped fresh dill. The batter for these, from Levana Kirschenbaum, can be made in the food processor. Many matzoh ball recipes call for schmaltz (chicken fat) or its pareve substitute, Nyafat. I like that these use the healthier vegetable or olive oil. Leftover matzoh balls freeze beautifully. When you remove them from their cooking water, let them drain on a plate then gently arrange them several inches apart on a cooking parchment-lined cookie sheet and freeze completely. When solid, remove them to a zip-lock plastic bag and store in your freezer. To defrost, simply add them to hot broth and add them to your soup. Mix all ingredients together in a bowl or in a food processor. The mixture will look thin: do not add extra matzoh meal in an attempt to thicken it. Chill for 1 hour. Using a slotted spoon, remove the matzoh balls and serve them along with your hot soup. Healthy, hearty mushroom-barley soup is a staple of the traditional Eastern European Jewish kitchen. It can be made with either fresh or dried mushrooms or a combination, as in this simple version, that includes dried porcini or Polish mushrooms, lending an earthy aroma to your kitchen as the soup simmers. If you enjoy a creamy mushroom-barley soup, puree one-third to one-half of the soup in a blender and return it to the pot. This soup will thicken when chilled, so add back some water or vegetable stock when reheating. Soak the dried mushrooms in 1 cup of boiling water for 30 to 60 minutes. Sauté the fresh mushrooms over high heat in a bit of oil for 8-10 minutes and set aside. Chop the onion, carrots, and celery and put into a 6-quart stockpot with the barley and 10 cups of cold water. Bring to a boil, reduce the heat, and bring to a simmer. Strain the dried mushrooms through a fine sieve lined with a paper towel or cheesecloth. Pour the remaining liquid into the soup pot. Remove the dried mushrooms from the sieve, chop them coarsely, and add them to the pot along with the fresh sautéed mushrooms and any remaining juices. Simmer the soup, partially covered, for about an hour or until the barley is tender. Season with salt and pepper to taste and serve with fresh dill. For a dairy meal, this soup is lovely with a dollop of sour cream. This simple vegetarian version of the traditional beet soup was given to restaurateur and cookbook author Levana Kirschenbaum by her Russian mother-in-law (published in Levana's Table: Kosher Cooking for Everyone). Thankfully, Levana recommends using a food processor to grate all the vegetables! Heat the oil in a heavy pot over high heat. Combine the onion, garlic, and celery in a food processor and pulse until coarsely chopped. Add this mixture to the hot oil and sauté until soft, about 5 minutes. Add the carrots, parsnips, turnips, cabbage, beets, potatoes, tomatoes, dill, and water and bring to a boil. Reduce the heat to medium and cook, covered, for about 1 1/2 hours. Add the sugar, vinegar, and salt and pepper to taste and cook for 30 minutes. Serve hot. This delicious and unusual chowder-style soup from Marlena Speiler's The Complete Guide to Traditional Jewish Cooking, hails from the Jewish community of Alaska who jokingly refer to themselves as "the frozen chosen." The recipe calls for fish stock, so I have provided a quick and easy recipe I discovered on about.com's Guide for Busy Cooks below it. Melt the butter in a large pan. Add the onion and cook for 6 minutes until softened. Stir in the flour. Reduce heat to low and cook for 3 minutes, stirring occasionally with a wooden spoon. Add the fish stock and potatoes to the mixture in the pan. Season with a little salt and ground black pepper. Bring to the boil, then reduce the heat, cover and simmer gently for about 20 minutes or until the potatoes are tender when tested with a fork. Add the smoked salmon scraps and the cubed salmon, then simmer gently for 3 to 5 minutes until it is just cooked. Stir the milk, cream, and chopped dill into the contents of the pan. Cook until just warmed through, stirring occasionally, but do not allow to boil. Adjust the seasoning to taste, then ladle into warmed soup bowls to serve. Do not use mackerel, skate, or mullet in this recipe; their taste is too strong and heavy. Place water, onion, carrot, and celery in stockpot. Tie peppercorns, parsley, bay leaf, thyme, cloves, and lemon rind in a square of cheesecloth and add to pot. Add rinsed fish bones and trimmings. Heat to a simmer over medium high heat. Simmer for just 15 minutes, no longer. Skim the surface of the soup, strain the stock, and refrigerate or freeze. Makes about 7 to 8 cups of stock. October 2007: Singapore Kosher Vegetarian Restaurant: It's Faux Good!